No matter how many displays you put up in your classroom, it’s hard to find anything as stimulating as the outdoors. You don’t have to go far to be ‘outdoors’ – just outside the window in fact! It’s free and can help you to deliver inspiring, memorable and outstanding lessons. Ofsted are keen to encourage Learning Outside the Classroom (LOtC) and have produced a range of documents to demonstrate the importance and value of Learning Outside the Classroom (LOtC). Learning Outside the Classroom has been proven to raise attainment, improve behaviour, develop team work skills, improve problem solving, develop creativity, improve attendance, the list goes on. Learning Outside the Classroom is most effective when it is an integral part of the curriculum. How about drawing a life size dinosaur on the field or playground? Or set up a stone age camp and explore the ways in which they hunted and gathered food. Maybe students could make bows and arrows and write a diary of their experience? 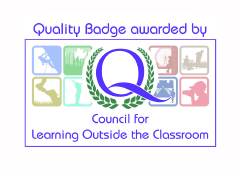 If you’d like to build your confidence in taking your classroom outside more often, why not attend our ‘Learning Outside the Classroom’ course? It will share ideas and best practice and you’ll leave with a pack of resource cards to get you started. We can also develop bespoke training to suit your needs. Email Leanne Bentley to make an enquiry. The John Muir Award is an environmental award which encourages awareness and responsibility for the natural environment, in a fun and engaging way. This award is open to everybody, all ages and backgrounds. The award covers 4 challenges: Discover, Explore, Conserve, Share. To get involved, or find out more visit the John Muir Trust website. If you’d like to know more then please email Leanne Bentley or call 01273 482522.